Cut the pocket based on the pattern, or like a trapezoid with a small triangle at the bottom to recreate the shape in the picture..
Overlock or zigzag around the edges to prevent fraying. Mark in chalk/crayon the lines for your fancy top-stitches. I used a CD to create round lines. Once the lines are drawn on the wrong side of the fabric, place the other pocket over this one, right sides facing. Pin in needles on the intersections of these lines and at the end of the lines. Turn and mark little dots where the pins are sticking out. Once you have the little guidance dots on the other pocket, use then to mark the fancy lines. Sew the top-stitches. I sewed then with the double chain stitch on my serger from the wrong side of the fabric, so the thicker thread is on the right side. Turn the top margin inside out and machine sew a straight line on each the lateral seam line, backstitch.Cut the corners close to the tip of the seams. Turn them inside out. Iron press all the seam allowances inward. This is how it looks like after pressing. Top-stitch close to the edge on the top of the pocket, then top-stitch again at a distance from the first seam.Now the pocket is ready to be placed over the pants/skirt.Put the pocket in place and sew close to the edge of the pocket, all around, except the top.Then sew another seam at a distance from the first one, starting further apart at the top, and going closer to the first seam at the corners.Backstitch at the start and end of the seam. Red Denim Dress – Wearable! Red Denim Dress, originally uploaded by fmirela. Finally I have pictures with the red denim dress! The pattern is from La Mia Boutique, and although it is made out of 10s of pieces and I do not understand Italian, it was fairly easy to assemble, but required a lot of time. Every stitch has been iron pressed and I added two parallel top-stitches in bright red thread to finish the denim feel for this dress. I love wearing this at work, I think it is great for summer, being sleeveless and it also can be worn maybe with boots and a form fitting long sleeve blouse under during cooler temps. I always buy a little extra fabric especially when there are bias pieces, somehow I cannot compute how much I need. This time I managed to sew a mini skirt, a hat and a belt out of the leftovers! Tonight I am hemming the skirt and I can;t wait to post about it. The hat and belt are still in the making. I have taken many photos of the sewing process, and I plan on posting small how tos about darts, jeans pockets, shirt collars…soon. This morning I was presently surprised by an email, saying that Fashion Geek has joined my neighborhood on the Blog Catalog: Everything you need to know about Wearable Electronics! Have a look at their articles and decide for yourselves. All I have to say is: I need to make time and read all of it, it is simply revolutionary and truly interesting! My mom’s a chemist and a seamstress, my dad is an electronics engineer, I’m a software engineer and I’m really digging this brilliant blog! BurdaStyle would like to introduce to you a new blog category: Featured Member! Now, I feel so honored and proud to be a featured user, since Burda has played an important role in my life as a hobbiest seamstress. Silk top closeup, originally uploaded by fmirela. This airy silk twill has been a joy to work with and now it is a joy to wear. It keeps me feeling cool and comfortable during hot summer days. I find this outfit to be very versatile, I can change the look in an instant, simply by wearing them together for a more dressy look, or take them apart and pair them with jeans or a T-shirt for the day. Red Denim, originally uploaded by fmirela. 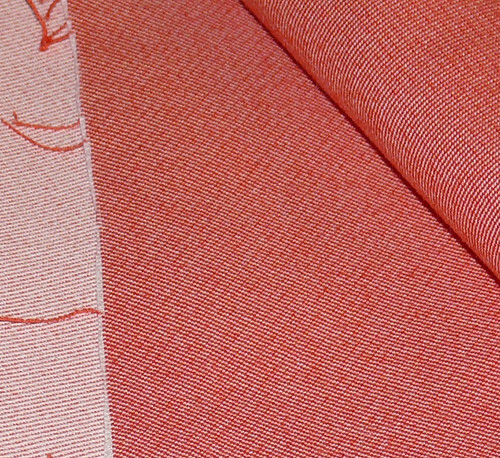 Another gorgeous find at Fashion Fabrics Club is this stretch washed red denim fabric. I had my mind set on a beautiful dress from La Mia Boutique, for a long time. Now I finally decided to go for it, and sew it in denim. The pattern is made up of many many pieces and the difficulty is set to 3 stars, meaning it will take me a while to finish this project. I hope to sew it in parallel with a sun hat, belt and maybe even a purse out of the same leftover fabric. I tend to be very economical when it comes to placing patterns over the fabric, and always have some useful leftovers. I will post instructions on how to sew and press bodice darts, appliqué jeans pockets and hidden button closures. Keep looking! Silk, originally uploaded by fmirela. 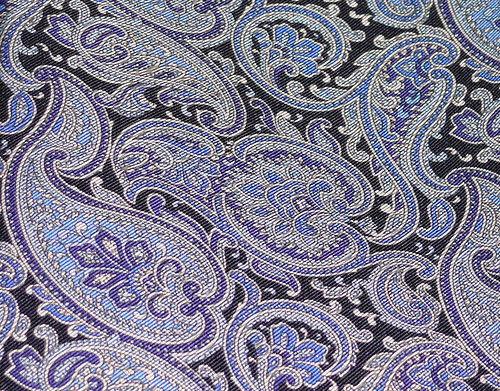 I got this gorgeous 100% silk from Fashion Fabrics Club and it is more beautiful then I had imagined. I have sewed a bias skirt, just over the knees in length. I was left again with a big bias triangle of silk, which of course turned out to be just perfect for my signature triangle top. I have sewn many meters of round lace out of the fabric (there goes the other triangle leftover, cut in bias bands). I used this lace for the skirts waist line, around the neck of the top. The blouse is like a corset in the back and the bias strips are now lacing it. I have received many compliments of the skirt, after wearing it with a plain T-Shirt at work. The look changes in an instant when the skirt and top are worn together, from day to night wear I’m one top away! I plan on wearing this during my trip to Vegas at the end of this month, and take many pictures with it! Spa Slippers – Luxuriously Embroidered, originally uploaded by fmirela. 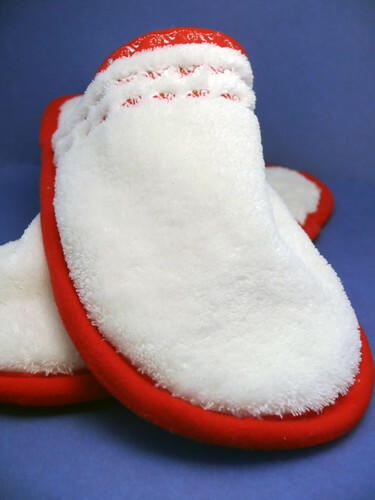 Treat your feet with these fluffy soft micro-fleece luxurious embroidered spa slippers, available online exclusively from Everywear! Wear them to the sauna, or jump into them after a relaxing shower and walk around the house. 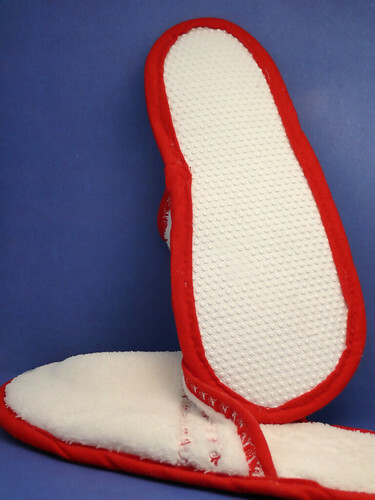 The sponge fluffy soles have adherent anti-slip rubber dots to prevent sliding over slippery surfaces. A layer of double sided stiff fusible interfacing has been added in between the sole layers for strength. For adding the fleece bias trim, instead of simply sewing a straight stitch, I chose to go with a repeating embroidery motif in contrasting thread, as a highlight. 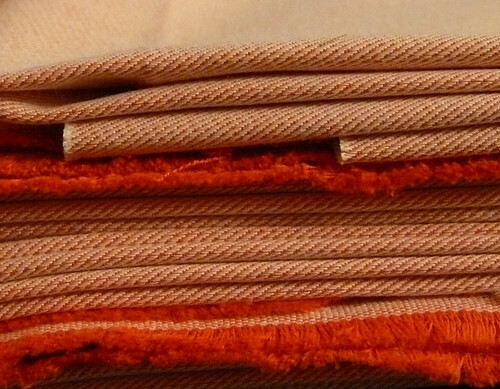 Then I sewed two more lines of the same motif, in mirror view and red thread over the white fabric. This creates an interesting embellishment for a simple fabric.